The Agriculture and allied sector GVA growth in the second quarter of FY 2015-16 is estimated at 2.2 per cent compared to 1.9 per cent in first quarter. The exceptionally dry start to the rabi season has affected sowing in all major rabi crops such as wheat, gram and rapeseed/mustard. Overall, the current outlook for agricultural growth in 2015-16 appears moderate at best at this juncture and is expected to remain similar to the 2014-15 growth rate of 0.2 per cent. 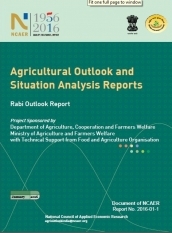 The findings of this report are based on a comprehensive assessment of farm input prices and availability, monsoon rainfall, market demand conditions and government policies impacting this year’s rabi and kharif crop production. Wheat production in marketing year 2016-17 is expected to be lower at 85 million tons as compared to the already poor 2015 production of 88.9 million tons due to poor weather, and wheat exports are likely to remain negligible. The 2015-16 rabi rice production is expected to be somewhat lower than the 2014-15 production due to poor post-monsoon rains and lower water levels in reservoirs. Rabi rice exports are forecast to decline to 9.0 million tonnes from 11.8 million tons in marketing year 2014-15.